My daughter Sophie was diagnosed with leukaemia exactly two years ago, when she was seven years old. Paul and I have three daughters, and it was because of Rainbow Trust Children’s Charity that we felt able to face the difficult road ahead. 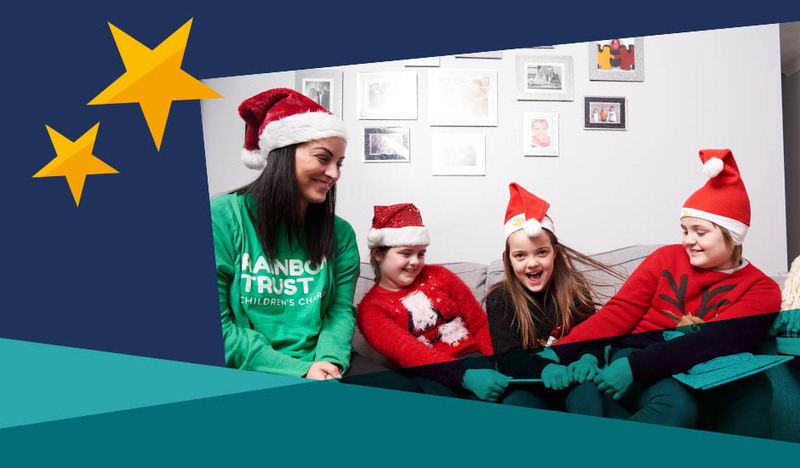 This Christmas, we want to help Rainbow Trust raise £20,000 to reach families like ours who need extra support, especially at this time of year. Will you help us? When Sophie was diagnosed, she and her sisters had only just learned what cancer was because we’d recently run the Race for Life in memory of Nanna and Grandpa. Soon after her diagnosis, she was admitted to intensive care and put into a coma while her body tried to fight several serious infections. We were told that she’d have to wake up on her own, if she was going to survive. One morning at the hospital, I met Sabrina, a Rainbow Trust Family Support Worker. Sabrina sat with me while I cried. I’d been in hospital for weeks and Sophie wasn’t getting better. She was so easy to talk to and understood how I was feeling. She explained how Rainbow Trust helped families like mine. It sounded exactly what we needed. Paul and I had been so worried about our other children, Chloe and Heidi. I stayed at the hospital while Sophie was at her worst and the girls would come to visit, but then they wouldn’t want to leave. Sabrina would take the girls to and from school while Paul went to work. She’d help with their homework, play games with them and take them out. Without her, there would have been no-one for them to spend time with and to have a little bit of normality. Just days before Christmas, Sabrina arrived at the hospital with presents for the girls. I’d been in hospital with Sophie so I hadn’t had time to shop and we’d all but cancelled Christmas. Then, on Boxing Day, we had the best present of all. Sophie opened her eyes. When Sophie did get to open her presents, we cried happy tears the whole time. We were so grateful to have been given time to celebrate Christmas together. If it weren’t for our Sabrina, Sophie’s cancer would have hit us a lot harder. She helped us find strength and gave the girls some of the normal childhood enjoyment they had missed out on. Our biggest worry was that all the girls would suffer, but Rainbow Trust made sure that didn’t happen. Please donate this Christmas and help raise £20,000 to reach more families going through a difficult time like ours.